In Bhutan, Tsechu is one of the largest festivals, it is held in the courtyard of the Trashichoedzong on the presence of His holiness the Je Khenpo, member of the monk and the civil servant, in the capital. Desi Tenzin Rabgay the 4th temporal ruler of Bhutan first started the festival. He introduced the Tsechu to celebrate the birth of Guru Rinpoche on 10th -12th Day of Bhutanese calendar. What appears as a gala feast of mask dances and people in bright attire is actually one of profound religious significance to the Bhutanese. Thousands of people turn up for four days dances and prayer, colourful and well-choreographed mask dances performed during this Tshechu. Besides, you will find the opportunity of photograph an exotic mask dance, a happy, welcoming people, the colorful traditional dances and distinctive architecture, tour western Bhutan like Paro, Thimphu, Punakha and Wangduephodrang exploring important cultural sites and monuments. DAY 03 & 04: THIMPHU FESTIVAL . DAY 05: THIMPHU – PUNAKHA EXCURSSION (1300m): 77KM/APPROX 2 ½HR. DAY 06: PARO TIGER’S NEST HIKE. Flight into Paro with Druk Air, Bhutan’s national Airline is spectacular. The flight takes you over the great Himalayas, offering most beautiful scenery of the world’s highest peaks. As you enter Paro valley, you will see the Paro Dzong (fortress) on the hillside overlooking the Paro Chu (river), with Ta Dzong, formerly a watch tower and now National Museum, above it. 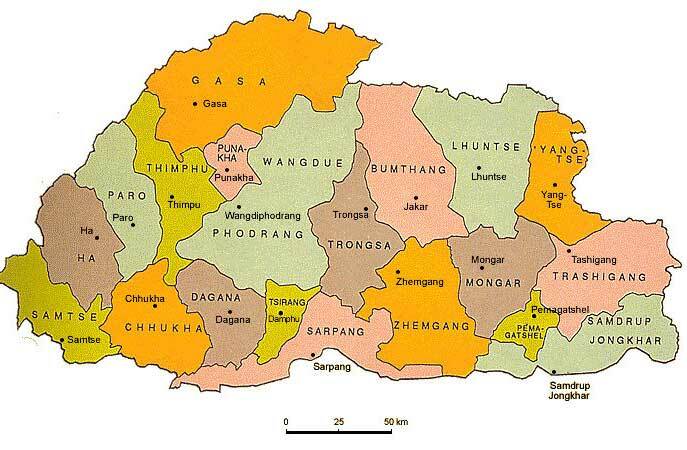 On arrival you will be greeted by our representative of Yeoong Travels and drive to Thimphu. The first stop will allow us to view the magnificent Tachocho Lhakhang, the hereditary place of worship for Bhutan’s Iron Bridge Builder and further drive we will reach to Chuzom marks by the confluence of Paro Chu (river) and the Wang chu. Opposite of us, at the confluence, are three protecting chortens each built in a different style. Evening stroll through the market and mingle with the local people, visit shops and weekend market. Overnight stay at hotel, Thimphu. Today’s exploration of Thimphu begins we will take with visit to National Memorial Chorten, a stupa dedicated to world peace and prosperity in 1974 in memory of the Third King of Bhutan; the Kingdom’s rich culture at the National Library; the National Institute of Zorig Chusum where students undergo training course in Bhutan’s 13 traditional arts and crafts; Folk Heritage Museum which will provide an insight into traditional Bhutanese farm house and rural past through exhibits and documentation of rural life. After lunch visit Changangkha Lhakhang, a fortress likes temple which lies perched on a ridge above Thimphu; Taken Preserve to see the rare national animal of Bhutan. This animal is chosen as the national animal of Bhutan for its uniqueness and its association with the country’s religious history and mythology. A further drive towards the BBS tower will provide a bird’s eye view of the capital; visit nunnery temple and followed by a visit to Tashichho Dzong or “the fortress of the glorious religion” which is Bhutan’s administration and religious centre and houses the throne room of His Majesty the King of Bhutan, other Government offices. It is also the summer residence of Je Khenpo or Chief Abbot. Overnight stay at hotel, Thimphu. After lunch visit Punakha Dzong which stands majestically at the junction of the two rivers- Pho Chu (Male River) and Mo Chu (Female River). The Dzong is said to be the most beautiful of dzong in Bhutan; it is an outstanding structure with intense artwork, and the winter residence of the Je khempo (chief abbot). Also this is the second dzong built in Bhutan by Shubdrung Nawang Namgyel in the year 1637. Evening drive back to Thimphu. Overnight stay at hotel, Thimphu. Today’s day will begin driving back to the Paro valley to take on a stunning hike on foot to visit the Taktshang Gompa or Tiger’s Nest viewpoint. Our hike to Taktshang from the road point will take through the well maintained path which is quite uphill and it takes around 3-4 hours at an average walking speed. The trail climbs through beautiful pine forest, many of the trees adorned with Spanish moss, and an occasional grove of fluttering prayer flags. We stop for a rest and light refreshments at the Taktsang cafeteria. This incredible monastery clings to the edge of a sheer rock cliff that plunges 900 meters into the valley below. Legend has it that Guru Padmasambhava, the tantric mystic who brought Buddhism to Bhutan in 747 AD, flew here on the back of a flying tiger Dorji Drolo, said to be his consort. We will visit the auspicious Kyichu Lhakhang, a scared monument pinning down the left foot of a treacherous ogress, which is built in 659 A.D by the Tibetan king Srongsen Gampo. This Monastery is one of the 108 monasteries built across the Himalayan region by the Tibetan King to subdue the Demoness that lay across the Himalayan region. The rest of the monasteries lie in other neighboring countries; Drugyel Dzong the imposing fortress which was the strategic vantage point for numerous defeat of invading Tibetan armies and here in clear weather can view the spectacular view of mount Jomolhar 7314m. In the afternoon will drive to the beautiful valley to the watch tower or locally known as Ta-Dzong. The third King Jigme Dorji Wangchuck housed it into the National museum in the 1960s. The seven floor museum highlights various aspects of Bhutanese culture and history dating back to the 7th century. A short walk downhill to the Rinpung Dzong which serves as the administrative center and school for monks, and walk further down crossing the traditional bridge into Paro Town. Overnight stay at hotel, Paro.